Attention! Attention! 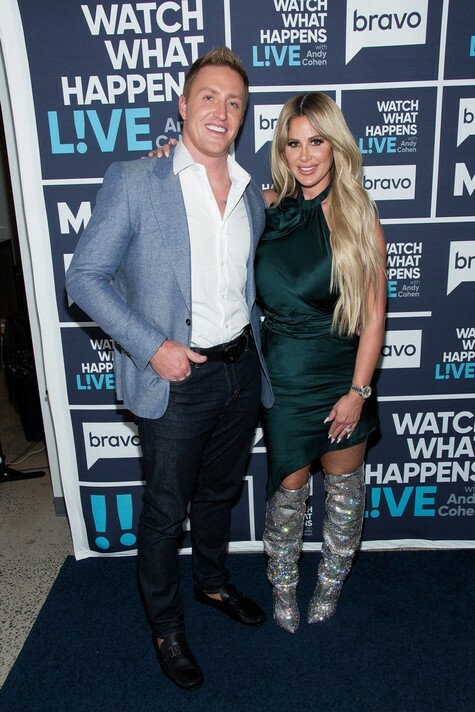 Major disclaimer for anyone who is about to watch Kim Zolciak and Kroy Biermann’s recent appearance on Watch What Happens Live. It is very evident that it was pre-taped and went down BEFORE the social media war with NeNe Leakes. Everything she had to say about NeNe was very loving and there’s no chance in hell that Kim could go from that brutal war of words to talking about how much she loves and respects NeNe in the same day. Aside from the immediately outdated NeNe tidbits, Kim and Kroy had a lot to share about their family including whether or not they want to have more kids…even though they already have six. A Watch What Happens Live episode with Kim would never be complete without Andy Cohen bringing up that Real Housewives Atlanta Season 1 photo to compare Kim’s nose to the original one that graced our TV screens back in the day. This time he switched things up a bit by showing the photo side by side with a throwback photo of Kim. He even admitted, “I have to say that your teenage nose looks like your current nose.” Kim couldn’t help saying, “If you show that picture one more time!” Andy insisted, “It’s a tradition!” Very true. I look forward to it every time. Andy attempted to stir the pot by asking if Kim has ever met Kenya Moore’s husband Marc Daly. She calmly answered, “Has anybody? No.” The RHOA film crew can say the same…allegedly. Speaking of stirring the pot, Andy asked Kim to name the biggest pot stirrer on Season 10. Kim confessed, “I feel like it’s me this year.” She added, “I just feel like I call people out. I’m over it. Life is too short.” Thank you, Kim. No one needs a boring Real Housewives season. If only there was someone in Orange County to create some (interesting) story lines. When discussing NeNe, Kim said, “I love her and I always will.” I wonder if she feels that way now. That Instagram argument was on another level. Speaking of OG cast members, Kim was asked if she would ever encourage Sheree Whitfield to get back together with Bob Whitfield. Kim said, “No. I know too much.” The viewers are in agreement with her on that one. Andy didn’t let Kim get off the hook though. She had to answer the question as well. She did manage to get out of sharing though. She teased, “I tried. You’ll see it all play out on Don’t Be Tardy Season 6.” That doesn’t sound like it went very well, but I guess we will see when the episodes air. She brought the conversation back to the question at hand and admitted, “I think it’s gross. I think there’s a line that Kim, NeNe, and Sheree never cross. It’s just a line of respect. I feel like that just went way too far- something I can’t even fathom.” Of course that made me wonder if Kim would say the same thing given the recent Instagram war. It also made wish that the episode was recorded live so we could find out what is going on between the two of them in real time. Switching gears, Kim admitted, “I have baby fever so bad.” She has six kids and a million pets. Clearly she’s into mothering, but she might have her hands full these days. Kroy wasn’t completely sold on the idea, but he did say, “At this point, but I’ll never say never.” Andy asked, “Did you not get snipped?” Kroy said, “You can go back.” That sounds like a lot to endure. If only he froze some sperm like Jim Edmonds did to conceive baby Aspen. Andy added, “Are you training a lot still?” Kroy said, “Yes,” and Kim revealed, “He just didn’t accept a couple offers.” Kroy continued to answer the viewer questions saying, “I would play outside of Atlanta if it’s the right deal.” Kim chimed in about his current career by saying Kroy is “Super dad. Super husband.” I can’t argue with that one. He really is such a family man. Nevertheless, Kroy admitted, “I’ve worked a lot in my career so right now I’m relaxing a little bit. I love investing. I love real estate.” Investing, real estate, and raising six children doesn’t sound like “relaxing” to me, but Kroy is a very humble guy. Kim jumped in and asked, “Relaxing? Are you kidding me?” Kroy explained, “Relaxing per say, compared to football.” Fair enough. Andy asked Kim about the possibility of new music. Kim explained, “I always said I wanted to be a one hit wonder and I got it. Like massively got it.” Damn right she did. She got her own TV show named after her song. Kim continued, “I’m happy with just the one song. I can’t say that I won’t ever do it again, but I wanted to be a one hit wonder and definitely got it.” Please do it, Kim. I just want all of the Housewives to go on a concert tour together and film it for a reality show. The next question was so timely and once again I couldn’t help wishing that the episode was live since Brielle Biermann’s Snap activity was at the center of the war between Kim and NeNe. A viewer wanted to know how they would feel if Brielle wanted to become a Real Housewife of Atlanta. Kim said, “I mean, I feel like she can handle it. She’s super of me. I feel like she can handle it.” Brielle is definitely getting some practice in these days. Or at the very least, she’s in a Housewife training phase. Then a caller asked Kroy, “What was your honest reaction when Kim said she wanted to go back to the Real Housewives and were you happy that she did it?” Kroy revealed, “I was a little bit hesitant, but when we talked about it and discussed what it brought and what she wanted to do, obviously I’m going to support her if she makes a decision. I’m here to back her and support her.” Husband of the year material right here. Not just this year, but pretty much every other. Kim really lucked out. And she made another NeNe reference. After saying, “Sheree and I have been friends for fifteen years,” Kim remarked, “NeNe, Kim, and Sheree have had a major connection for fifteen years. There’s a lot of drama there.” That’s for sure. There could be a whole show just about these three. That’s actually not a bad idea. Andy, are you reading this? TELL US- ARE YOU EXCITED FOR KIM’S RETURN TO REAL HOUSEWIVES OF ATLANTA? DO YOU WANT BRIELLE TO BECOME A HOUSEWIFE?